The makers of the Fitbill F.Row claim it's the 'smartest rower ever'. That's quite a boast to make when you're up against the likes of Concept2 and First Degree with a track record of innovation. But then again, the F.Row costs around a tenth of these brands. As with all our reviews we'll start with the unpacking and assembly. The F.Row comes in a few parts and requires only minimal assembly and shouldn't really challenge even the most unskilled DIYer. The rowing position is okay at best, the seat is actually quite comfortable and the footrests are wide and will hold your feet secure and in place. But if you're over 5' 7" then forget it. The compact machine has a short beam and you just won't be able to get a decent workout. 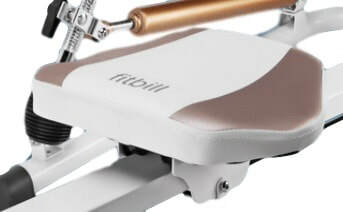 The full motion handles mean you can row or scull. Most rowing machines have one handle and replicates rowing with one oar. Sculling is using two oars in involves a wider movement. So in effect you can have two different types of workout using a different set of shoulder muscles. The F.Row uses hydraulic pistons for the resistance. One on each side (painted gold in photo) provides the resistance for your muscles to pull against. There's a choice of 8 levels of resistance which can be selected by sliding the end of the piston up and down the handle. If you have a weakness on one side you could have different levels for each handle. But for a machine that claims to be 'smart' this is quite an old-fashioned and pretty crude way of doing things. Plus, there are a number of problems with hydraulic pistons losing resistance over time - see here for more on pistons. However, Fitbill's app is pretty good when you consider the price - see Display unit below for more details. 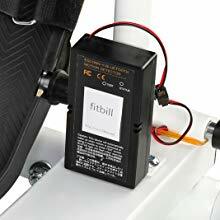 You may wonder why we've only scored 45% for features when it comes with a motion sensor, iPhone holder and app, but the limitations of the actual rowing machine beneath the tech really does limit the use of these features. The motion sensor does nothing more than a standard console and monitor, in fact compared to many it's actually less because it cannot know how much work you're doing (watts) and how many calories you're burning. The six month warranty on the frame and parts is around about what you'd expect for low cost rowing machine. 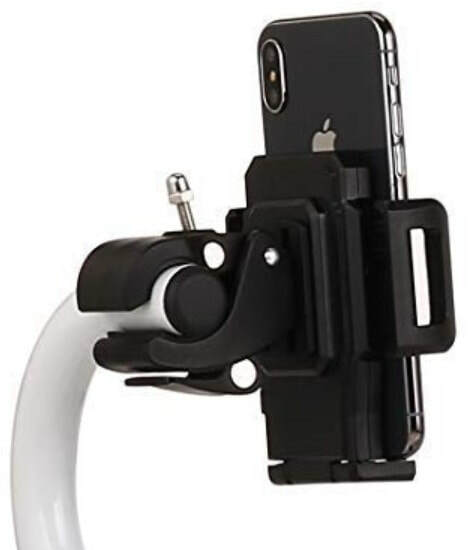 This doesn't come with a display as such because on this machine it's your smartphone - see the photo below right. The app displays the usual data such as distance, time and stroke rate. One plus is that it stores his information and will show your progress over time. This is always good for motivation if you can see the improvement in your stats - and also hopefully on the scales! The F.Row can be summed up as an old-fashioned, generic, low-cost rowing machine fitted with some hi-tech gadgets. This does allow for a few more features to be offered on a model costing under $200, but to be honest, it looks more like a gimmick. Using a motion sensor is clever, but does it really do more than a standard half-decent performance monitor? Probably not in our view. But perhaps further down the line we'll see Fitbill installing their technology on better machines, but for now, this doesn't cut it for us. Not suitable if you're over 5'7"
If both your budget and your space at home is limited, the Stamina 1110 is worth considering. 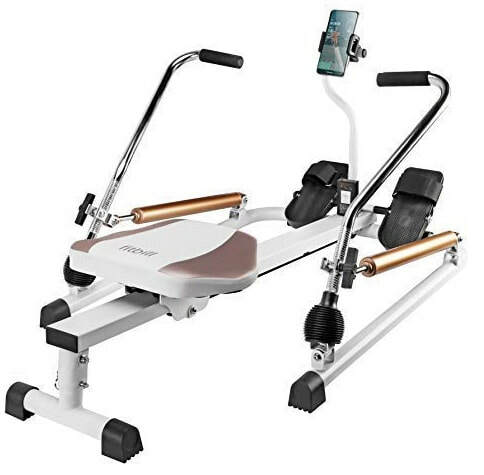 If you can go for a few dollars more you can get a better rower and workout with the Sunny RW5515. "I don't have much space and this small machine fits nicely into my home. 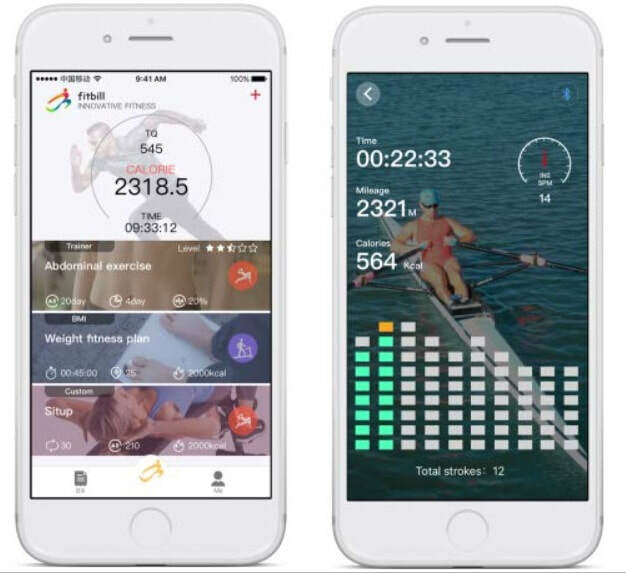 I quite like the idea of using my iPhone and the app is pretty good, but it's difficult to row at higher speeds meaning the workout is limited." Lindon, user for 3 months.